The green in the dress even inspired me to (badly) play with eye shadow - something I rarely do! Even better, I was off to a blogging event hosted by the relatively new company Funky Laser (try not to sing that in your head! I DARE YOU! ), which was set up as a jewellery making workshop, but I'd've classed it more as Glitter and Gossip, as we chatted about a number of issues, including the up coming North East Blog awards, and how Funky Laser are getting involved (but shhhhh, don't want to spill too much information!!). Due to said car issues, I was a little late to arrive (the event was held in their industrial space in Hartlepool, which is a beaut of a complex and sounds almost commune-esque from what I gathered from Leah!) which is a major source of social anxiety for me - being late and getting lost - so I may have been a little uncensored with my views! Even gave a little lecture on cultural appropriation but hey! 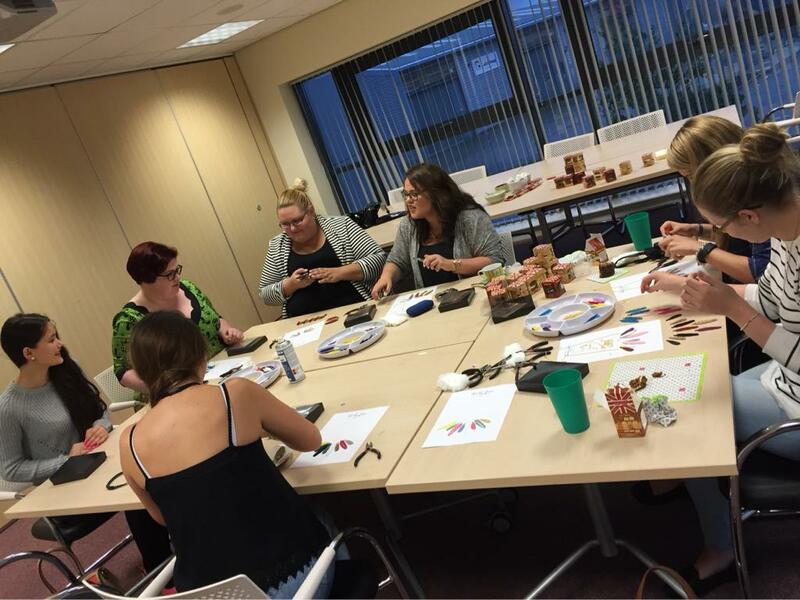 The room was the perfect size for the 6 of us to get a-crafting and turning pre cut acrylic feathers into individual pieces! Yes, I know mine does NOT go with my dress, but you get the idea! It is clear that the team behind Funky Laser are passionate about what they do, and what they have to offer the market - putting the customer and their commissions first, including making cocktail stirrers, cake toppers, and even hats out of acrylic! There really seems to be no limit to what the Funky Laser team and Big Bertha can achieve together! The Katnis looks awesome on you! so glad after a rubbish start the day ended well- Im like you when I get lost or late. Except I usually add tears into the mix as well.